I recently decided to add a set of LED strip lights to our trailer. We had looked around an RV show recently and saw all the trailers and RV’s that had LED Lights and various types of lanterns on them. After looking around we decided permenently mounted strip lights were what we wanted. The next thing was to shop at our local RV store where we discovered that the price of them was $75-150. We decided to shop around and found a number of options on Amazon. We could choose from just solid white, various other solid colors, and multi color controlled by a remote. We decided on the multi color with a remote and started looking at prices. We were able to find them for about $30 on Amazon and had them delivered a couple days later. The next thing was to decide on mounting location and how to power them. I knew I wanted a clean install that did not require me to pull out a power cable and plug it in every time we stopped. I figured the better way to do this was to have them mounted on the wall of the rig, although some people choose to mount them on the awning roller. So the next thing to look at was how to power them. I really wanted a clean setup that had no loose cables or manual plugging in. So I decided the way to do this was to get the power cord into the rig and hook it up to the outside light switch on our control panel. Because the control panel and door were near the back of the rig, going thru the existing porch light to the inside was not feasible, plus it would have come in behind the Microwave, making for a lot of work to try to fish it back to the control panel. I decided the best way to accomplish this was to drill a hole in the rig. This was actually the cleanest way to do it, as it allowed me to take the existing AC power cable that came with it and cut off the AC wall plug. I then would be able to feed the cable from the control box for the LED’s into a hole in the wall and run it about 2 feet to the control board where I would solder it into the Porch light switch. Since the wall plug converted 110AC to 12DC this would mean no plugging in and I could control it with a switch inside. 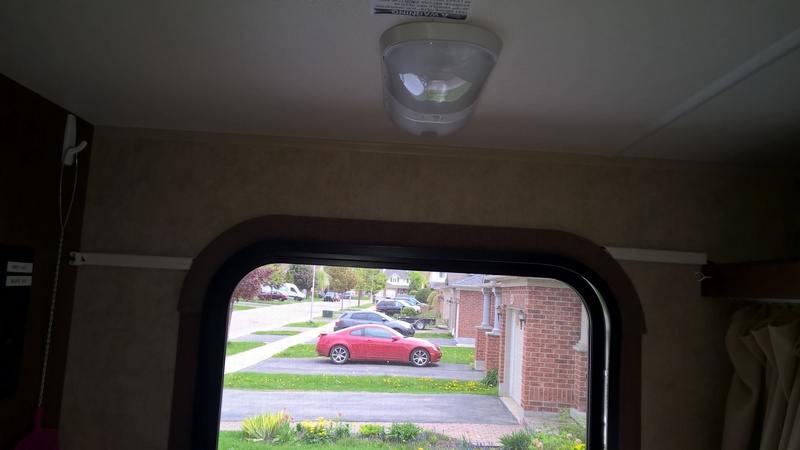 I started by mounting the LED strip on the side of the RV just under the awning after wiping the area with alcohol wipes to clean off wax and make sure I had a good surface to stick the strip to. After I lined it up and took the adhesive off, I installed the strip. I then cut off about 2 feet from the end to make it fit the exact length of the awning. 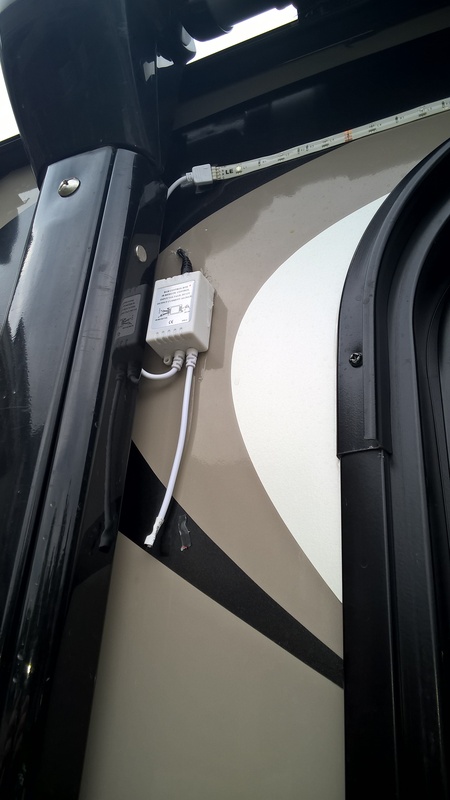 I then plugged the strip into the control box and stuck the control box in the corner beside the awning arm using 2 sided tape. I then plugged in the power plug and put silicone all around the box to help it stick and to ensure no water would get in. Then came the test. I simply ran the power cord thru the door and temporarily hooked it up to the porch light switch. After I was sure I had all the wires identified and I verified the light strip worked, it was time to permanently run the power cord. The scary part came next. I picked the absolute smallest drill bit I could find for the cable, about 1/16. I wanted no play, the cable had to be really snug in the hole. Next I crossed my fingers and drilled. I made sure I drilled from the outside in, but on a very sight incline to ensure any water that got on the cord would not be able to run down and into the hole. I fed the cable thru the hole and pulled it all the way in, leaving about 1 inch left outside to create a drip loop. The drip loop is very important and should be below the hole. This allows any water travelling down the wire to go below the hole and drip off below. Not having a drip loop could result in water following the wire right into the trailer. After that I ran the wire over the door to the control board and tucked it into the door frame. I also used 2 small strips of adhesive raceway on either side of the door to cover up the wire. The final step was to solder the wire to the switch and retest. An Update 4 years later: The light strip and all the exterior parts have held up well and nothing has failed due to exposure. The only thing I can notice is that the actual strip itself has yellowed a little, but there is no sign of it getting brittle. Thanks for the post. I’m also interested in doing this, and I appreciate the ideas! 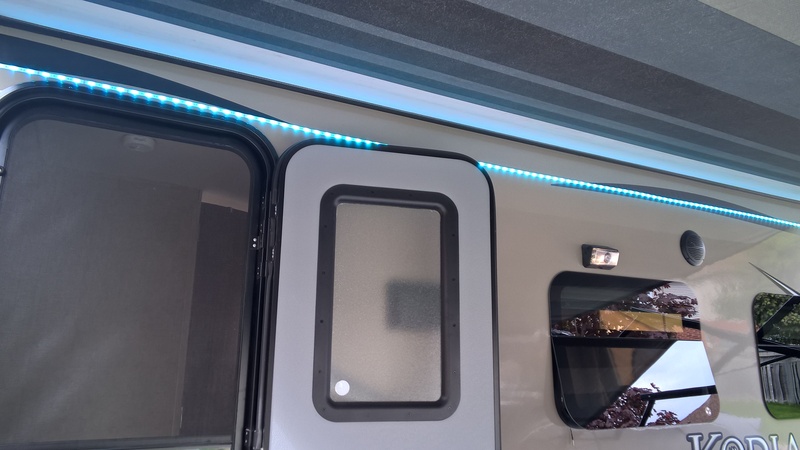 I have the same LED light strips for my deck and mantle and I want to add them to my new camper just like your setup. I am not sure how old this article is but I was wondering how the adhesive strip on the LEDs is holding up? That is my only unknown. I was thinking of cutting double sided tape to fit the strip but if yours is holding I will go that route. I cleaned the wall with alcohol first and they have stayed on the wall with the adhesive they come with for 2 years so far.